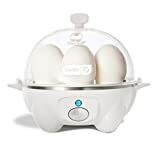 You don’t have to listen to everything we say, but do yourself a favor and listen to this: the Dash Rapid Egg Cooker will in all likelihood be the best gadget you ever buy for your kitchen. This little wonder device makes cooking breakfast a breeze. If you can push a single button, you can cook perfect eggs every single time in the Dash Rapid Egg Cooker. The white model is on sale for just $19.99, which definitely makes it a no-brainer.